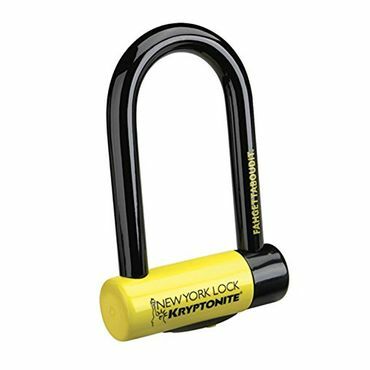 If you're looking for a good bike lock, Kryptonite is still king with its New York Fahgettaboudit Chain and New York Fahgettaboudit Mini u-lock. Both are about as secure as it gets. New for this update in our u-lock section is the titanium TiGr mini, which has gained a lot of fans for its ultra-light, ultra-strong construction. If you need a hefty, imposing lock that will keep your bike (and maybe even a friend's) safe from determined thieves, the Kryptonite New York Fahgettaboudit Chain lock is a good bet, reviewers say. Available in 3.25- and 5-foot lengths, the Fahgettaboudit has six-sided 14mm manganese steel chains that stand up to all but the most brutal power tools in expert tests. The accompanying disc lock has a 15mm steel shackle and a hardened double deadbolt that owners say is easy to operate. 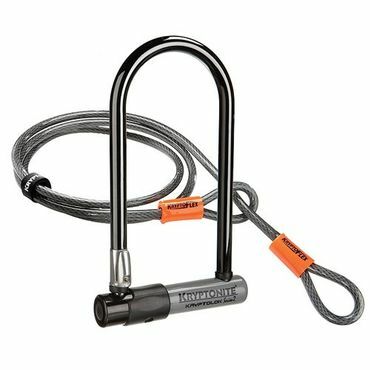 If you need a convenient lock for a low-crime area, reviewers say the OnGuard Akita Resettable Combo Cable Lock should be tops on your list. It has a 12mm braided steel cable that is thicker than many comparable cable locks, and at just 1.2 pounds, it's light enough to throw into a backpack without weighing you down. The steel ball combination lock held up to experts' attempts to pick it, and owners say it's easy to dial in or change the combination as needed. Experts say u-locks are often toughest for thieves to crack, and they also say the Kryptonite New York Fahgettaboudit Mini is one of the best u-locks you can buy. The thick 18mm steel shackle laughed off bolt cutters and hacksaws in experts' tests, and the lock's small size makes it compact enough for travel without giving thieves room for leverage attacks on your bike frame. Additional features include a protective vinyl coating that keeps bikes' paint jobs pristine and a generous anti-theft protection policy. U-locks are most imposing when used with a secondary lock that can keep your bike's front wheel safe, too. Reviewers say the Kryptonite Series 2 Standard is a good marriage of the two locks. The u-lock has a tough 13mm hardened steel shackle to protect the bike frame and rear wheel, and the included cable can easily protect the front wheel or your bike seat. Other nice features include a u-lock mount, anti-rattle bumpers and an anti-theft protection policy. Chain locks have tough steel links that are typically connected to a small disc lock that requires a key to open. They can be quite heavy, with heavier, thicker chains generally offering better security. Because chain locks can be quite long -- some are 6 feet or more -- they're especially good for keeping multiple bikes safe or securing bikes to larger anchors such as lampposts or benches. But because of their weight, they're probably best suited for keeping a bike safe near home or another place where the lock won't often have to be moved. There are numerous cable locks on the market, but you won't find many experts who recommend them if you really want to protect your bike from thieves. Cable locks use steel cables attached to a combination lock, key lock or padlock; you simply thread the cable around your bike frame and through both wheels (and around the seat, if you have enough cable). Unfortunately, they can be broken in seconds using a simple tool such as a bolt cutter. Still, they can be a decent secondary option when used in combination with a tougher chain or U-lock. Many riders also love cable locks because they're lightweight and easy to carry, saying they're convenient for warding off an opportunistic thief or for use in very low-crime areas. In general, experts say u-locks provide the best protection against bike theft. U-locks have a thick steel shackle attached to a crossbar with a keyed lock. Sized properly, they don't leave much space for someone to insert a crowbar or other tool between the bike and anchor, helping minimize leverage that can be used in a theft. They are generally lighter and more portable than chain locks, and their smaller size makes them easy to put in a backpack or mount on your bike frame for travel. However, u-locks aren't large enough to protect your whole bike. Urban bicyclists often use a u-lock to secure the frame and back wheel of their bike to an anchor like a lamppost or bike rack, and use a secondary U-lock, chain lock or cable lock to secure the front wheel. "The Best Bike Locks of 2017"
"The Best Bike Lock Review"
There are a lot of good expert tests of bike locks, though many of them are several years old. Some of the more updated, in-depth tests are from outlets including TheSweethome.com, SportsIllustrated.com, and OutdoorGearLab.com. We also considered expert roundups from sites including CyclingWeekly.com, IceBike.org, and BikeSmarts.com. To find out how the bike locks these experts recommended hold up under real-world use, we evaluated hundreds -- sometimes thousands -- of owner reviews from sites such as Amazon.com, REI.com and PerformanceBike.com. The result is our recommendations for bike locks with the best combination of security, ease of use and durability. 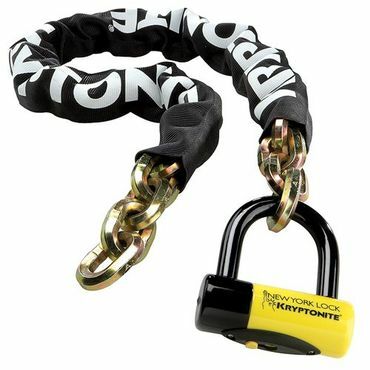 If you don't mind paying for a top-notch chain lock -- and you won't need to tote it around -- reviewers say the Kryptonite New York Fahgettaboudit Chain (Est. $130) is your best bet. The Sweethome.com's Duncan Niederlitz says it's "the best chain for the money for high-security situations," and only two other chain locks took longer to cut through in his tests – but both cost significantly more money, too. Make no mistake: the manganese-link Fahgettaboudit is massive and heavy. The lock is available in 3.25- and 5-foot lengths. The shorter chain weighs 10.8 pounds, while the longer chain weighs a whopping 15.25 pounds. Reviewers say it's ideal for securing a bike at a permanent location like your home where you won't often need to move the lock, or for securing multiple bikes together. But they're unanimous on this point: It's not a lightweight lock you'll want to ride with. The Fahgettaboudit comes with a disc lock that has a 15mm steel shackle and a hardened double deadbolt. It includes a dust cover to keep the lock cylinder clear of dust and debris. A nylon cover prevents the chain from scratching or nicking bikes. Three stainless steel keys are included, and one has an LED light. However, reviewers warn that this light is flimsy the lock mechanism isn't the smoothest sometimes. The lock comes with one year of theft protection up to $5,000, which is generous; however, you'll need to present proof of the broken lock to be eligible. If the price or weight of the Fahgettaboudit is too hefty for you, the OnGuard Mastiff (Est. $60) also offers solid protection at a more reasonable price point, many reviewers say. The 10mm square links are made of reinforced titanium. One of Bicycling.com's "top performers," the lock resisted bolt cutters and a hacksaw, and even outlasted an angle grinder. However, note that experts with The Sweethome say OnGuard locks are vulnerable to picking, though this isn't a complaint we saw elsewhere. The Mastiff is available in 3.5- and 6-foot lengths that weigh about 8 and 11 pounds, respectively. Though that makes it lighter than the Fahgettaboudit, the Mastiff is still more ideal for deterring thieves in high-crime locations where it won't often have to be moved, reviewers say. The longer lock is particularly good for securing multiple bikes. The OnGuard Mastiff comes with an integrated double-bolt lock that has a rubber cover to protect both the lock cylinder from debris and the bike from scratches. A water- and heat-resistant nylon chain cover also helps minimize paint damage. Five laser-cut keys are included; one has a micro light. The lock comes with a $2,000 one-year theft protection plan that isn't available to customers in the state of New York. Like Kryptonite, OnGuard requires you to send in the broken lock to receive coverage. If you're willing to sacrifice some security in the name of portability, the wearable Hiplok Lite (Est. $60) chain lock could be the answer. Its 6mm hardened steel chain isn't as hefty as the chains on the Fahgettaboudit or the Mastiff, so it might not foil the most determined bike thieves. Still, many reviewers say it's still tough enough for all but high-crime areas. Designed to be worn like a belt, Hiplok Lite adjusts to fit waists from 26 to 44 inches. It also weighs only 2.2 pounds -- a far cry from the much heavier Fahgettaboudit and Mastiff. If you're less concerned with weight and want a portable, wearable lock that might withstand more than opportunists, the 5.3-pound Hiplok Gold (Est. $90) has a 10mm hardened steel chain. Some reviewers grouse that Hiplok Lite, which is about 2 feet long, is a bit too short for anyone who may need to lock a bike to a lamppost or something other than a bike rack or slender pole. The disc lock on Hiplok Lite has a 10mm hardened steel shackle and a molded nylon case that comes with three keys. The chain has a protective black sleeve to protect bikes from paint damage and make the lock more comfortable to wear, though as experts at SportsIllustrated.com note, it may still feel a bit cumbersome for some riders. One version, Hiplok Lite Superbright (Est. $55) has a reflective white sleeve for increased visibility. While experts caution that you shouldn't make a cable lock your bike's sole means of protection, they do recommend them in combination with heftier locks. 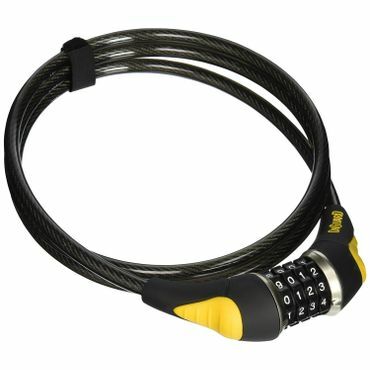 Reviewers say the 12mm braided steel OnGuard Akita Resettable Combo Cable Lock (Est. $25) is one easy-to-use cable option that has a lot of plusses. Remember, however, that top-notch security isn't one of them: in tests conducted by OutdoorGearLab.com, the cable fell victim to "a variety of inexpensive household items," such as garden shears. Most owners caution that this cable lock is just like any other cable lock in that it may work for quick stops or very low-crime areas, but little else. Weighing in at just 1.2 pounds, the Akita is lightweight, but OutdoorGearLab.com's Rylee Sweeney and Ross Robinson say it's not as easy to transport as a coiled cable lock that's designed to wrap up into a smaller, neater package. Still, wrapping the 6-foot cable "isn't too much of a hassle," and it's easy to secure with the included Velcro strap. The cable is also easier to thread through a bike's frame and wheel than a coiled version, they note. If you just have to have a coiled version, check out the similar OnGuard Doberman Resettable Combo Coil Cable Lock (Est. $25). The Akita comes with a steel ball combination lock that wasn't easily picked in OutdoorGearLab.com's tests, though as we noted above, testers with The Sweethome disagree, saying all OnGuard locks may be at risk of picking. Still, owners say it's easy to set. The rubber-coated lock head helps prevent paint damage to bikes. If you prefer to forgo the combination lock, the OnGuard Akita Key Cable Lock (Est. $20) comes with an integrated double-bolted key lock and is available in more lengths. Tough for thieves to defeat.